This carte de visite photograph features a father and son posing for their portrait at the studio of Ernst Gopel. The boy is wearing a nautical style outfit. The studio was located in Aalborg, Denmark. Aalborg is the fourth to largest city in Denmark. This cdv is in very good condition (see scans). This cabinet card photograph features four siblings. The foursome include three brothers and one sister. The children are identified by first name via an inscription on the reverse of the photo. The boys are Emil, Carl, and Niels. I am unable to decipher the sister’s name though it is clear that she was born in 1890. The image comes from the studio of Budtz Muller & Company which was located in Copenhagen, Denmark. 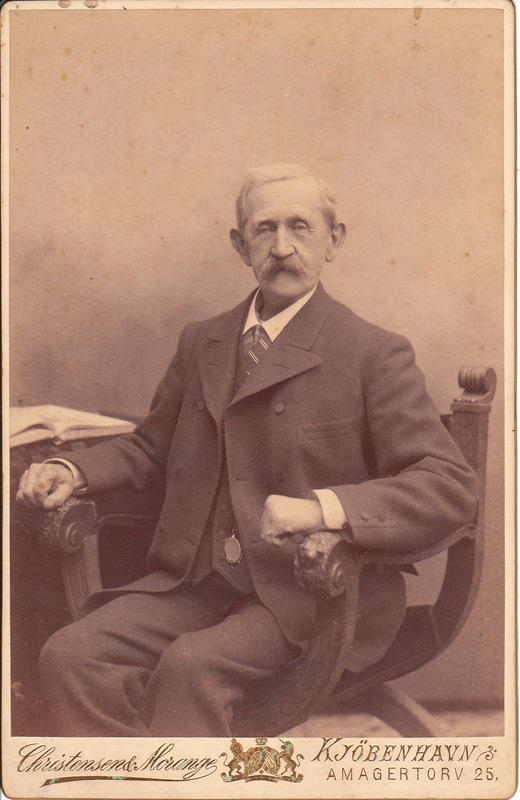 Bertel Christian Budtz Muller (1837-1884) was a Danish photographer. Muller began his career as a pharmacist before he became a popular photographer in Copenhagen. In 1884, Muller’s studio was taken over by Ludvig Offenberg. Despite the change of ownership, Offenberg did not change the name of the studio. It is interesting to note that Muller’s will included a provision to set up a fund to support needy photographers. It is also of note that Muller is also known for his portrait of writer, Hans Christian Andersen. 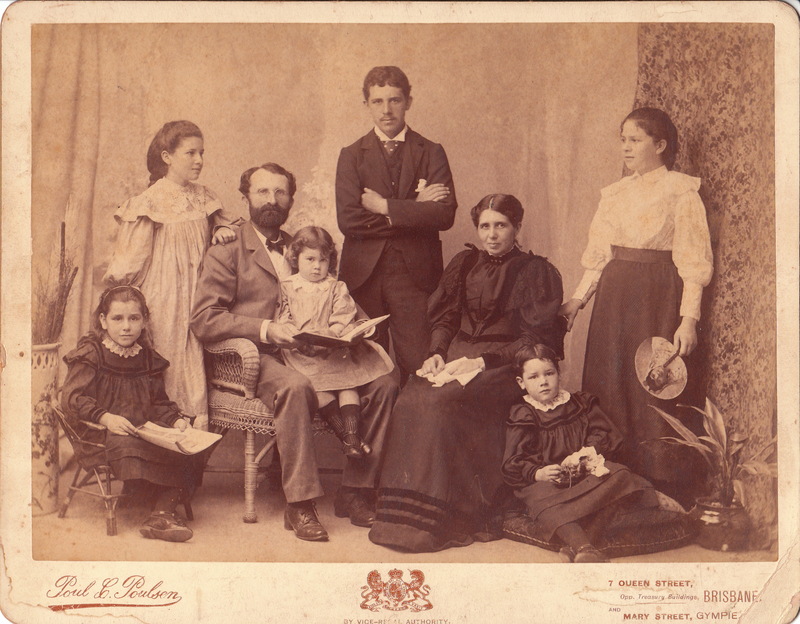 This cabinet card features what appears to be four siblings gathered together for their portrait at the studio of Gunnar Mogensen. The boy in the photograph is wearing a sailor style suit and his sisters are all dressed in white with dark belts. The older sister has very long hair, while in contrast, the two younger girls are wearing short hairstyles. Mogensen’s studio was located in Silkeborg, Denmark. To view other Danish photographs, click on the category “Denmark”. When does the fun start? That seems to be the question on the faces of the six young lads posing for their photograph at the studio of Julius Jacobsen, in Copenhagen, Denmark. The boys are dressed up in their finest clothing for this group photograph. 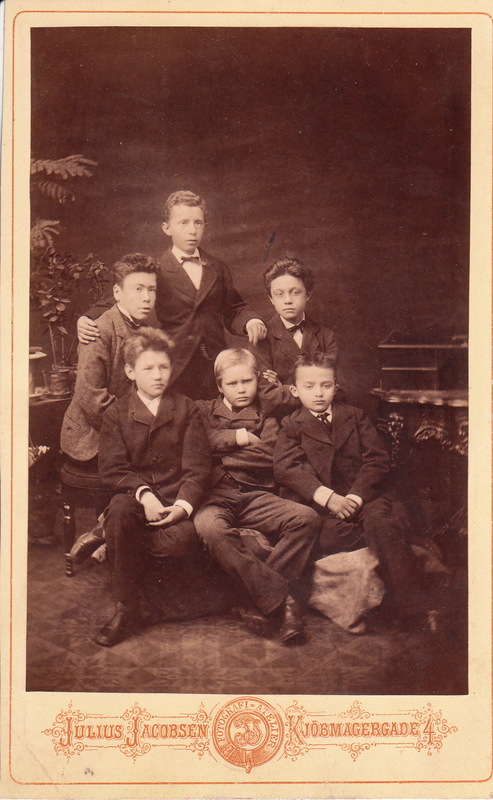 Jacobsen took on the ambitious task of photographing six young boys. Jacobsen’s studio was located in Copenhagen, Denmark. It appears that the lads were not in a very cooperative mood at the time of the photograph. They appear bored, sleepy and irritated. Some of them have mischievous expressions but probably they are just boys being boys. How are these six kids related in terms of being photographed together. Perhaps they are classmates? They seem somewhat affectionate in the photograph leading one to believe that they knew each other well. This cabinet card features three precious little children wearing adorable outfits. 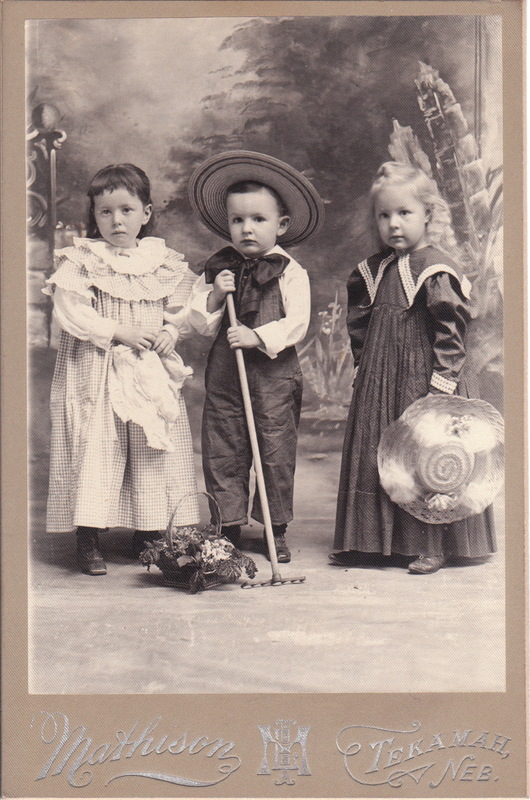 The child in the center of the image is holding a rake and wearing a large bow tie and a straw hat. The two girls are flanking the little boy in the middle and each girl is holding their hat. There is a basket of flowers on the floor in front of the trio of children. The photographer of this image is the Mathison studio in Tekamah, Nebraska. Ingbert L. Mathison (1868-1935) was born in Denmark in 1868. He came to America with his parents at the age of 2. He grew up in Iowa and came to Tekamah, Nebraska in 1891. He became a photographer and later added furniture sales to his business. The 1900 US census reveals that Mathison was married to Grace Theodoria Christy (1870-1902) and the couple had four children between the ages of 3 and 9. Two years after this census, Grace died, leaving Ingbert with four young children. Ingbert soon got remarried. His new bride was Mary Etta Slaughter (1873-1939). The Mathison family then moved to a community outside of Denver, Colorado. Ingbert worked as a farmer, and later, a grocer, in Colorado. He died in a Denver hospital in 1935 at the age of 67. The cause of death was hemorrhages of the stomach. The Shelton family poses for their family portrait at the studio of Poul C. Poulsen in Brisbane, Australia. The photographer appears to have provided the family with props to use in this photograph. The bespectacled Mr Shelton reads to his daughter as she sits on his lap. A second daughter sits in a miniature chair and is holding an open magazine. The eldest daughter (on the far right side of the image) holds a fan that features the image of a pretty woman. Fans such as this, frequently had images of famous actresses of the era. Mrs Shelton has a handkerchief on her lap while another daughter is holding flowers. In the back center of the photograph is the Shelton’s young adult aged son who has his arms folded across his chest and a look of disinterest on his face. Poul Christensen Poulsen (1857-1925) was born in Denmark and arrived in Sydney in 1876. In 1882 he moved to Queensland and opened a photographic studio a few years later. He was later joined by brothers and sisters from Denmark. He opened branches of his studio in other Queensland towns. In 1898 he was appointed the Danish Consul at Brisbane. Over the years, his sons and grandsons entered the photography business. There is evidence on this particular cabinet card that dates it somewhere between 1894 and 1898. The studio located in the town of Gympie that is listed in the advertising on the front of this card, existed between 1894 and 1898. An elderly gentleman poses for his portrait at the studio of Christensen and Morange, in Copenhagen, Denmark. The grey haired man, dressed in a suit, is sitting in a chair next to an open book, which lies on a desk or table. The man’s pocket watch can be seen behind his open jacket. Note the interesting design of the chair that the gentleman is occupying. The old man’s facial expression is open to interpretation. At first glance, he looks quite serious; but upon further examination, he seems a bit amused as he stares at the photographer. The Christensen and Morange studio photographed a number of well known people in Denmark. Some of the photographer’s portraits are held by the Royal Library, in Copenhagen. 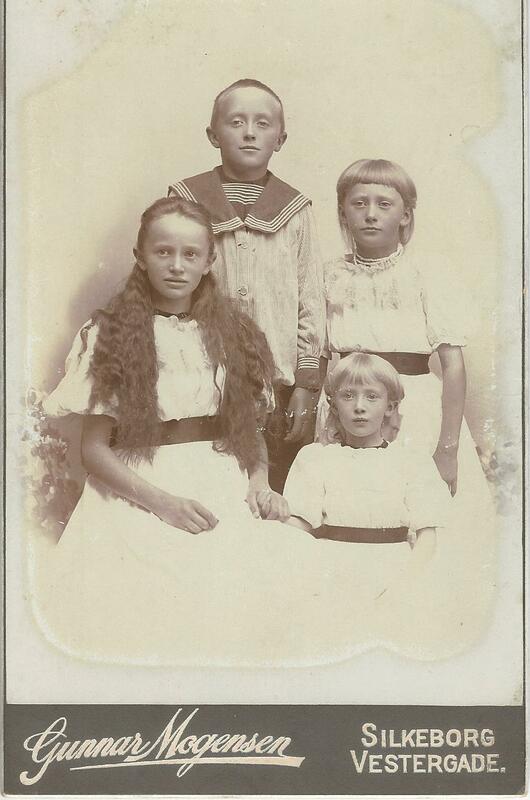 To view the Cabinet Card Gallery’s collection of photographs from Denmark, click on the category, “Denmark”. A pretty woman poses for her photograph at the studio of Hansen & Weller in Copenhagen, Denmark. The studio’s address was 28 Bredgade. 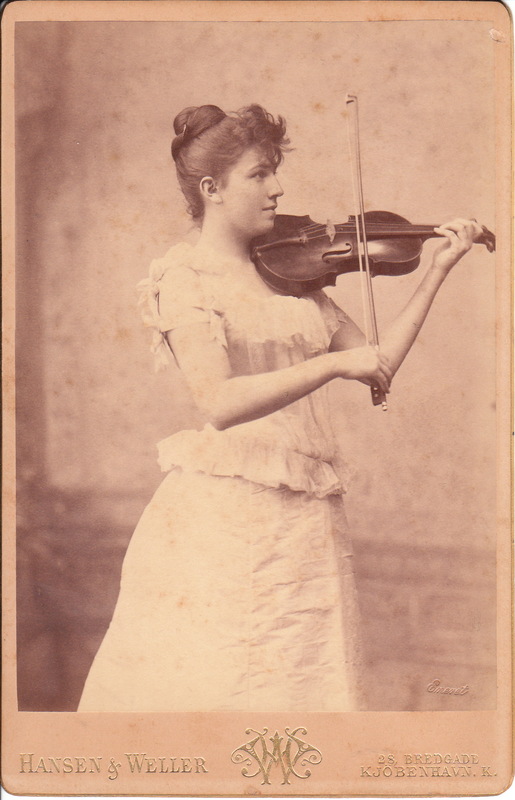 The woman is playing her violin with her bow. Her hair is up and she appears to be wearing a corset , giving her a lovely figure. One of the photographers is George Emil Hansen (1833-1891). He was a pioneer Danish photographer. His father and brother were also photographers. He won photography awards in London (1862) and Berlin (1865). Hansen was the photographer of the Danish Royal Family. His photographic work spanned from 1856 through 1891.